Tub spins fast counter clockwise on wash cycle forcing water out of the tub, agitator turns counter clockwise. machine very quiet. Sorry but this "answer" does not align with the question at all. Sorry but this "answer" does not align with the question at all. Does it agitate for the wash cycle? When you get to the spin cycle, is the motor running and 3 pulleys underneath turning, and the tub is not turning? If so, I had this issue with this model. The brake would not release, and I had to "persuade" it. Also, I had to set the plastic cam correctly on the bottom of the unit to that is would engage and release the brake at the proper points. Did not need a bearing kit, just had adjust a few things that got knocked around by the movers. Only took me 6 frustrating hours. Hopefully take you less than 1. BEWARE the 200# force for the spring! Cost $0. Mental anguish = still tabulating. I had the same problem. You need a brake kit. it holds the drum still while in the agitate mode. the centrifical force of the water during that slow spin is causing the water to spill over the top of your drum. easy and cheap fix. hello you need to change drum rollers but if u remarked water dawn the washer and burn smell it could be the motor OR THE BELT because when the drum stop turning or turn slowly the motor turn fast on the belt when spin time it make this smell . Kenmore 90 tub spins excessively clockwise during wash cycle. there should be 2 or 3 springs that hold it, they mite have broke, take off back panel an check. If your agitator is a 2 piece, it has a rachet action and turns free counter clockwise and locks to the bottom piece when turning counter clockwise. The transmission disengages the agitator when it is in the spin mode. If you put the washer in the spin cycle the agitator should free up. 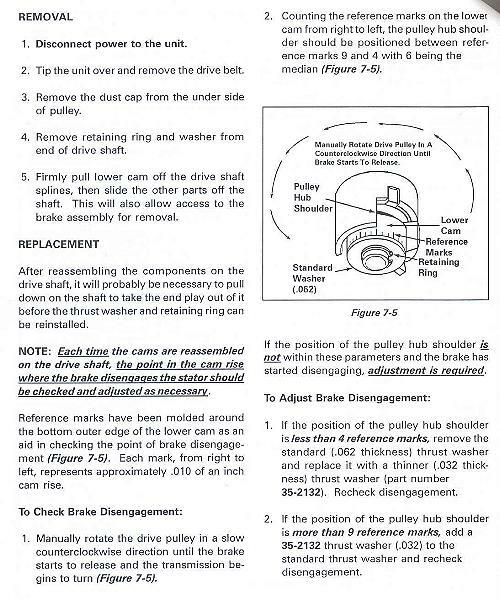 If the washer is spining ok and the agitator is not turning free you have a transmission problem. Could I please get a follow-up to this previous issue? I just had one more question, posted on the 30th of October. Thank you! Have a manual for Bosch WFLI 2440 Front Load Washer?